• Casting Flexibility – Will your die caster deliver cost-effective solutions in the required quantities? Rangers is an excellent choice for aluminum production runs of 100 to one million pieces a year. There is no aluminum die casting job either too large or small for the production staff at Rangers. companies in the western states that use real-time x-ray technology for ongoing quality assurance of castaluminum parts. Our die casting company’s quality control and ISO certification ensures your aluminum die castings meet exact casting specifications. • Quick Turnaround – Will your die caster deliver your job on time? 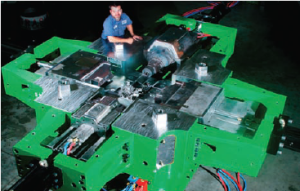 Our in-house aluminum die casting design, production and finishing ensures that orders are ready when you need them. We do our own precision machining of aluminum alloy castings, complete metal finishing and cast aluminum parts assembly to save you time. Plus, we’re close to our major customers, eliminating shipping lags from offshore suppliers. 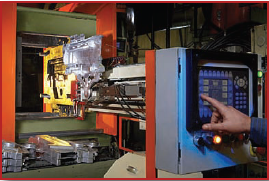 • Experience – Does your die caster have the experience necessary to produce the complex shapes you need and to manage your die cast program properly? We have delivered effective customer solutions for nearly seven decades. Rangers’ company experience is backed by a stable management team that knows and monitors industry trends. We know what it takes to produce exceptional die cast aluminum components. • Collaboration – How will your die caster work with your team?We work with our customers to understand their design needs and develop effective solutions. Listening to your needs and understanding critical production requirements ensures long-term success and meaningful working relationships. We can help you convert existing parts from other materials to cost-effective aluminum die castings using the appropriate aluminum alloys. We invite you to learn more about our aluminum die casting capabilities… You are encouraged to call us toll-free at: 1-877.386.9969. 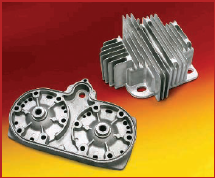 Aluminum die casting is an excellent choice whether your parts require sharply defined shapes with smooth or textured surfaces. Components produced by aluminum die casting are well suited for a wide range of attractive finishes, such as powder coating. Aluminum die casting is an affordable solution for prototyping as well as for high volume, mass-produced manufactured items. Rangers produces parts for many consumer, commercial and industrial end products. high-pressure casting – at forces exceeding 4500 pounds per square inch. 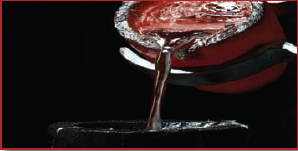 As a result, we can produce highintegrity, near net-shape castings with excellent surface finishes. Rangers can produce castings in a variety of sizes, shapes and wall thicknesses that are strong, durable and dimensionally precise. No matter how simple or complex the part your design requires, Rangers can cast it for you. 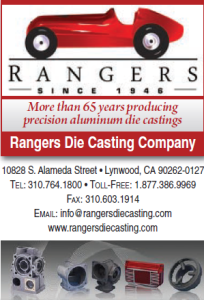 Rangers Die Casting completed a successful year in 2013 and we’re looking forward to serving you even better in 2014 and beyond. To help us improve our services, we’d love to hear from you. This is your invitation to connect with us to express whatever is on your mind about Rangers. Naturally, we enjoy hearing your positive comments, but we welcome your critiques as well so that we can have your input as we plan the future of our operations.